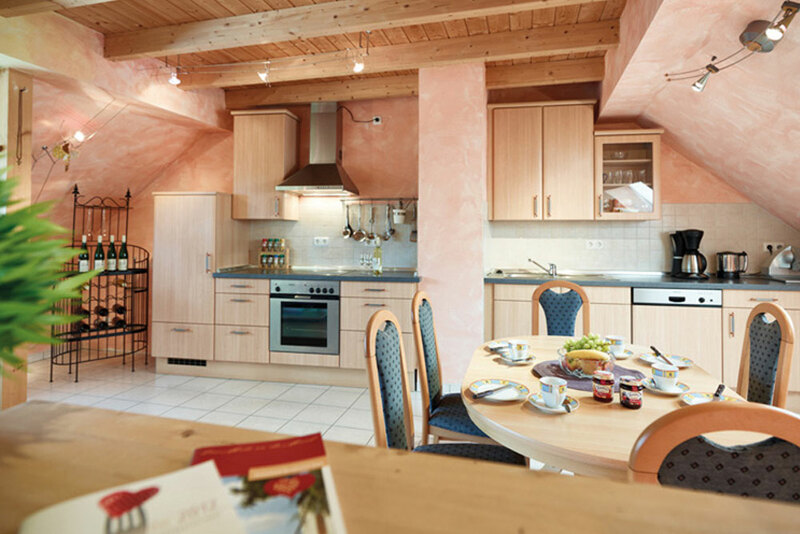 Our spacious apartment in Lieser is opened since April 2012. Approximately 50sqm on the 2nd floor, penthouse for 2-4 persons. bathroom washing machine and dryer in the bathroom. The flooring consists of tiles in the kitchen area and bathroom, in the remaining area of laminate. The sloping roofs have a positive effect on the atmosphere, and the cozy feeling is enhanced by the unobstructed view of the rafters and the beamed ceiling. Prices include towels, electricity, bed linen and final cleaning for two persons. Apr. - Jul. / Okt. 2 Nächte 145,00 € n.V.
3 Nächte 200,00 € n.V.
4 Nächte 235,00 € n.V.
n.V. = Das Angebot ist in dieser Zeit leider nicht verfügbar.